Freeze-dried bananas are a delicious and healthy food to always have on hand. These little bites of delicious goodness simply burst with flavor in your mouth! Bringing our customers the best quality and natural ingredients is important to us. That’s why all of our freeze-dried fruits, including freeze-dried banana chips, are non-GMO, guaranteed free of heavy metals and pesticides, certified Kosher, and packaged in BPA free containers. These dried fruit banana chips are so good you can even eat them straight out of the jar or throw them in a trail mix to give it a sweet boost! Everyone from babies to elders and stay-at-home moms to long distance backpackers will enjoy the convenience of freeze-dried banana chips. No more worrying about fruit flies swarming around your over-ripe bananas and constant trips to the store to get fresh ones. Freeze-dried bananas are a versatile food that makes a perfect addition to anyone’s pantry. Add some freeze-dried bananas or banana powder to your favorite banana bread recipe for a flavor boost that will impress your family and friends. Puree for a quick and healthy baby food your little one will love or let your kids snack on them as a healthy alternative to sugary snacks. Kids love them! 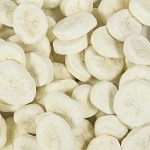 If you have a crowd to feed, or simply want to buy at wholesale prices, you can order our freeze dried bananas in bulk. Bananas are a favorite fruit of endurance athletes and for good reason. Not only are bananas high in potassium, but they also boost high levels of dietary fiber, vitamin B6, vitamin C and they’re naturally very low in fat. The fat that is present in bananas is a special kind called sterols that can block the absorption of cholesterol making them a smart choice for your cardiovascular health. And although our freeze-dried bananas taste sweet, they have a low glycemic index. Other companies offer dried banana chips that are fried in oil. Our freeze-dried banana slices are never fried! The only ingredient is 100% pure and natural banana. So what are you waiting for? Give us a call at 1-800-696-1395 to place your freeze-dried banana chips order today!